Reduce insurance premiums by reducing and elimination losses through safety awareness and education of employees. Program designed to reduce property, liabilty, auto, & workers compensation (WC) premiums. Single biggest factor that affects insurance premiums are previous losses. It is a proven fact that businesses with a stronger safety culture have fewer losses. Strengthening a business’ safety culture involves repetition and consistency. 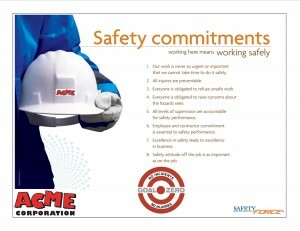 Businesses that have tried to increase safety culture now have a way to engage and educate employees. Hassle-Free program managed by Insurance Force. Once we have created your RiskForce Analysis and your Risk Score, we go to work on the agreed upon action items. No matter which programs and procedures we agree upon, it includes these steps, steps to reinforce and increase your commitment to safety. Because one of the best ways to keep insurance premiums under control is to have reduce and eliminate losses. Step 1. Rollout of safety awarness to all employees. A 15 minute safety meeting, presented by Insurance Force, can be added to a company wide meeting or as its own meeting. 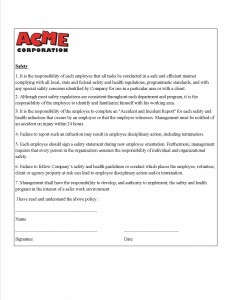 The meeting includes a physical commitment as your employees sign your custom 2×3 safety commitment board. This professional sign can be displayed as a reminder for your employees and showcased to your customers showing your committment to safety. Insurance Force will help you implement your RiskForce Action Items. You can alter the messages and program to fit your need. The key is having a 3rd party, like Insurance Force, to help hold your business accountable. Finding the time to get this to happen is the hardest part. Insurance Force will help you set up a hassle free program. By showing the insurance carriers you have a documented safety program in place, this helps maximize the available credits to reduce your insurance premiums. Step 3. Reinforce, Reinforce, Reinforce. A commonly accepted guidleline in advertising is the “Rule of Seven” which states that a prospect must be exposed to a branding image seven times before the prospect is aware of your product enough to actually make a purchase. Your product your are selling to your employees is SAFETY. At the first company wide employee safety meeting, admimistered by Insurance Force, employees are encouraged to sign up for Safety Questions. Each monthly email is simply one multilpe choice question. Even if your employees do not open the email, they still read the subject line: safety. 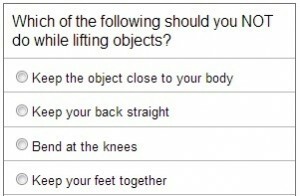 To engaged your employees, all employees who answer the question correctly will be entered to win a $25 gift certificate. Put SafetyForce To Work For You! SafetyForce is available for property and liability clients of Insurance Force. For more information or to enroll in the program, please contact us.